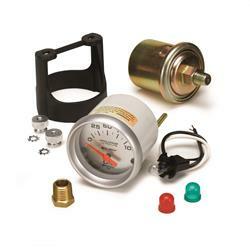 I love this gauge and the others in the series, the sending unit for this gauge are junk you will have to replace multiple times, I would expect much better from Auto Meter. The need to fix the issue with the sender. Was very satisfied with these on my boat, installed this on a street rod, much more accurate than the Summit gauges that were in it before. not installed yet, however it looks great, shipping was fast, an it should do the job nicely. I have used these in many builds; I like the clarity, design, and reliability of AM gauges.